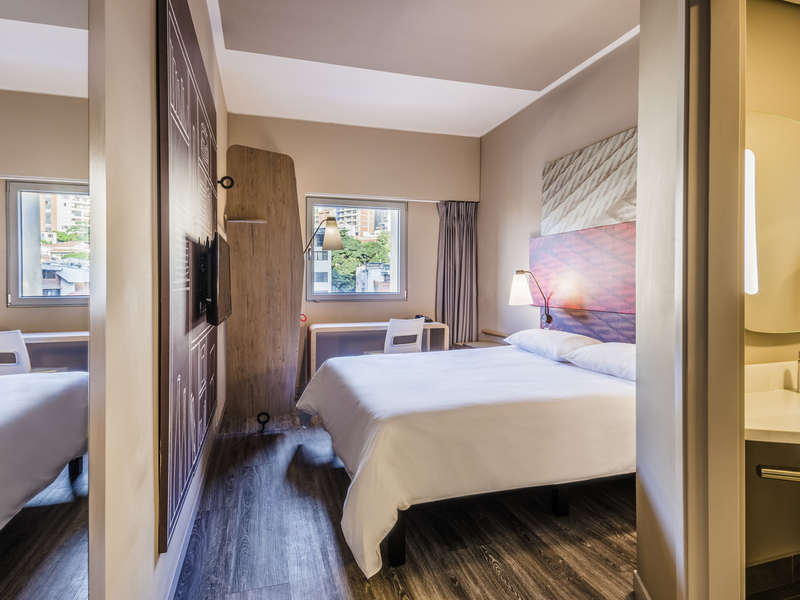 The ibis Cali Granada hotel is strategically located to the north of the city near bars and restaurants, as well as 1.9 miles (3 km) from Cali Transport Terminal and 15.5 miles (25 km) from Alfonso Bonilla Aragón International Airport, ideal for anyone looking for comfort at a low price. Relax in modern rooms equipped with the comfortable Sweet Bed by ibis. This budget hotel even has air conditioning, free WIFI, a restaurant, parking and a bar open 24 hours. Dogs up to 33 lbs. (15 kg) are also welcome. Modern and inviting, the new ibis room with Sweet Bed has everything you need: large bathroom, modern decor, queen-size bed, Internet and a flat-screen TV with the best international channels. Modern and inviting, the new ibis room with Sweet Bed has everything you need: large bathroom, modern decor, twin beds, Internet and a flat-screen TV with the best international channels. Standard Room with 1 double bed and 1 extra bed for children. Discover our 24-hour bar, where you will find a wide selection of drinks and dishes to enjoy at any time of the day.